Today was unexpectedly the last day for one small business man who sells sugar cane along Karanja , Olympic road. He died in misteriuos ways not to be understood by his business neighbours. Jacky Mwikali, his neighbour only recalls a few minutes after the man died he called her to helped get some money from his own wallet to get some food from the hotel he is used to eat. This was not to happen since at that time he was shaking the whole body and from his mouth you could see some kind of white stuff coming out [foam] and in a few minutes time as they were trying to get the hotel attendant, the man died and up to now the cause of his death is yet to be determined. A small Harambee is currently going on at the place to enable the body to be taken to the Mortuary. As they try to get in touch with his family. Everyone at the place was surprised to learn of how this kind of death really happened as i could note from the conversation that was happening at that time. Above is the place where the man conducts his business and where he died today. 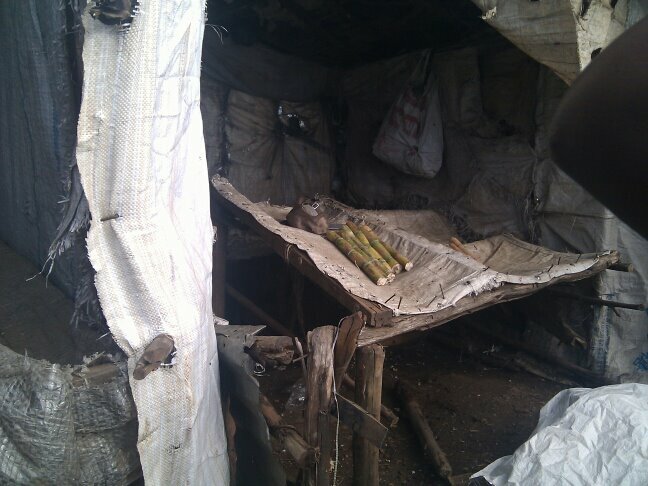 This entry was posted in Death, Health, Kibera and tagged google.com, Kibera, voiceofkibera.org. Bookmark the permalink.